We’d love your help. Let us know what’s wrong with this preview of Living Clojure by Carin Meier. If you’re an experienced programmer looking for a thorough but gentle introduction to Clojure, this is the perfect guide for you. Author Carin Meier not only provides a practical overview of this JVM language and its functional programming concepts, but also includes a complete hands-on training course to help you learn Clojure in a structured way. The first half of the book takes you through Closure’s unique design and lets you try your hand at two Clojure projects, including a web app. The holistic course in second half provides you with critical tools and resources, including ways to plug into the Clojure community. To ask other readers questions about Living Clojure, please sign up. I met Carin (aka Gigasquid) on one of the (Middle) European Java conference and for me, she was the paramount of the gig. And because I'm returning to the Clojure after 5 years now, I grasped her book. It was a good choice. In the beginning, Carin makes a good parallel - if you want to learn a new language, you should treat it like if you want to learn to run. It makes sense, you can't train for marathon in few weeks. Clojure is the same - you can learn the syntax and bunch of functions in couple of days. Maybe even a small project. But you won't stick. The biggest obstacle would be probably a mindset. Really 7/10. This book is short, practical introduction into Clojure for people who heard about it, and want to quickly start to use it. It covers very basics of syntax, collections, concurrent programming & webdev. But it lacks deepness (imho - that's why 7/10). This review has been hidden because it contains spoilers. To view it, click here. This is a good first book for someone who has not done any work on lisp family of languages. I would recommend Brave Clojure( BC) after this as I started of with BC but it seems to jump the gun a bit at places though a good 2nd book. - last 2-3 weeks of "training"
This is not a very good book. It is incredibly broad and shallow. The author touches topics that shouldn't even be in a beginner's book, like ClojureScript, and core.async, and Ring/Compojure; and at the same time the information is not deep, it's surficial at best. Unclear is the target audience of the book. The author says that it's for beginners who know at least one other programming language, but the complexity and minutia change so much from page to page that I can't imagine a novice actuall This is not a very good book. Unclear is the target audience of the book. The author says that it's for beginners who know at least one other programming language, but the complexity and minutia change so much from page to page that I can't imagine a novice actually learning something from here. Great book for a beginner. Nothing bad with the transducer chapter but it felt a little bit misplaced. A gentle and very effective introduction to Clojure. This is probably the book I'd recommend for someone just getting into Lisp for the first time. I've dabbled in Clojure off-and-on for awhile now, but it never really stuck. The focus on projects and how to use Lein is also invaluable. Very few books go into detail on these facets of the language, but as a day-to-day programmer, these mechanics are possibly even more important than the language semantics. Carin's focus in this book is really on t A gentle and very effective introduction to Clojure. This is probably the book I'd recommend for someone just getting into Lisp for the first time. I've dabbled in Clojure off-and-on for awhile now, but it never really stuck. Carin's focus in this book is really on taking you from 'zero' to 'productive' as quickly as possible. I also appreciate the training regimen in the 2nd half of the book, as well as her overview of the Clojure community, & where to find help. This is the kind of information that really makes a language stick. Great way to get in touch with Clojure. Very small chapters with straight forward examples to get using with the Clojure anatomy. I’ve read from cover to cover in a few days without try anything but the examples in REPL. I’m feeling comfortable to get a in-depth Clojure’s book with this knowledge. I don’t recommend though, to anyone who may have some understanding of Clojure. Worked through the first part (not the 8 week plan part) and that took about 8-10 hours (did it 2 hours at a time over a week), so if you want to do the whole book, plan that. The weekly/daily practice part at the end: still working through it when I have time. Excellent, lucid intro to the syntax and the semantics of the language. I learned Java for the first time somewhat thoroughly using Kathy Sierra's book in 2005. This is clear like that -- only Clojure is about 1-2 orders of magnitude more powerful. Was trying to do a self-study with this, but got too busy. Hope to get back to it some day. Very well written. For beginners, I think this book is very good. I really like the level of detail in most chapters, and I especially enjoyed the variance in pace: Most chapters go methodically over a certain topic, but there is also a chapter that combines everything to create a web app with a lot of moving parts in a single chapter. I liked most of the training plan a lot. Really good idea to just start with 4clojure exercises, because why not? They're very good and just the right level. The exercises created b For beginners, I think this book is very good. I really like the level of detail in most chapters, and I especially enjoyed the variance in pace: Most chapters go methodically over a certain topic, but there is also a chapter that combines everything to create a web app with a lot of moving parts in a single chapter. I liked most of the training plan a lot. Really good idea to just start with 4clojure exercises, because why not? They're very good and just the right level. The exercises created by the author were also very good and provided me with interesting challenges. I do have a few minor complaints, though. After a while, it felt to me like the Alice in Wonderland references became a bit awkward. I don't mind references to fiction throughout a book in general, quite the contrary, I find it quite refreshing. But in this case, I found that the examples were sometimes a bit weird and more contrived than necessary. Also, the final exercise was a bit of a disappointment. The last week of the training plan is dedicated to building a complete web app and deploying it to Heroku. There are instructions on how to get an app running on Heroku, which is quite helpful. After these instructions, I was expecting a description of the app to build, but this is not how the exercise is designed. Instead, the author allocates a hammock day for the student to come up with their own good idea for what to build. I'm sure this works well for some people, but I would much have preferred to be told exactly what to build. For me, coming up with an app idea is simply an annoying distraction at a point where I'm eager to start applying everything I've read about. This would also have allowed the author to design a really good challenge that covered much of the material in the book - possibly with some optional features. Excelent book! 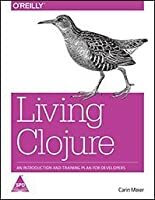 If have tried to learn Clojure and for some reason just can't wrap your head around it, this is the book that you are looking for. There several things that I like, but the one that I like the most is the way the explain the examples: piece by piece and then all together (of course, clojure is concise enough that allows to do this, but still, no all the authors do it this way). Also, the program at the end of the book, is great. What is quite unique about this book is the *training plan* it has at the end. I believe more emphasis should have been given to it and it should be at the beginning or spread throughout the book, so you start with the plan as you start the book. From the two introductory books I read regarding Clojure, this one was the most accessible although like almost every other book out there, it assumes you are already a programmer. I liked that it was short. However, the book felt like it touched on the tip of the iceberg. I would have liked more in depth information on how to build a web app. After reading this book, I feel I have learned the fundamentals but will need to supplement the information I learned here in order to have a better grasp on Clojure. Одна из лучших книг, что я встречал по Clojure для начинающих. Рассматривается только то, что нужно для того, чтобы начать и чтобы разобраться в этом языке. И при этом дается ровно то, что нужно для того, чтобы понять возможности Clojure.